The Philippines is a basketball-craze country. Filipinos—young and old—all over the country love to play basketball. 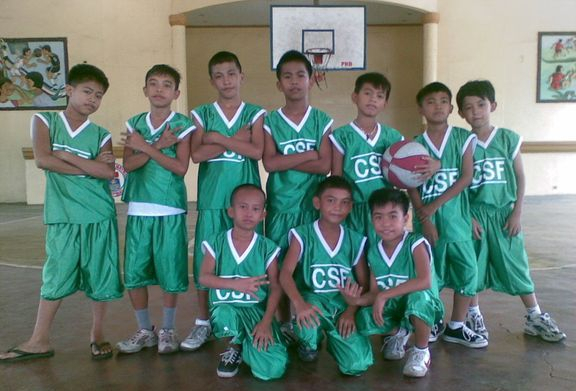 CHILDREN SPORTS FELLOWSHIP (CSF) is more than just plains sports. It is more than just a sporting competition. It is more than just a sports development. It has a moral, ethical and spiritual content that can never be found in the program of other sports organizations. At CSF sports development is soul/character development of the young—moving towards becoming the persons they were created to be and deeply need to become. As a matter of fact, CSF caters to the whole man as he is designed by God. Physical Dimension. Creation theologians affirm that our human body—intricately and miraculously woven and fashioned—is a gift from God. Hence, the creation mandate to take care of the physical universe includes our stewardship to enhance and develop our physical well-being. One way to do it is through sports. Disciplined physical training finds its anchor in the Scriptures (1 Tim. 4:6-10). Mental Dimension. Our physical well-being sharpens our mental perception. A sluggish mind is a resultant effect of a sluggish body. Our physical health has a direct bearing with our mental health. Social Dimension. Sports fosters camaraderie and our sense of humanity. Dr. Alfred Adler, a psychiatrist, speaks of it as “an inborn social feeling—a connectedness of the whole cosmos within us. It is part of being a human being. Indeed, politics divides but sports unites. Human ideology polarizes but sports unites. Sports makes us “indivisibly united” (Dr. Bruce Milne’s words). Spiritual Dimension. A philosopher says that meaninglessness and/or emptiness plagues our age. Emptiness within and emptiness without is what we are. Emptiness within is the resultant effect of the meaninglessness of life. There is an “unheard cry for meaning” (Viktor Frankl). Children Sports Fellowship (CSF) will lead kids and teens to a saving and relational knowledge of a knowable God in the person of the Lord Jesus Christ. Precious Heritage Ministries Foundation, Inc. uses Sports as the avenue in reaching kids for Christ who otherwise cannot be reached by direct evangelistic church-related activities. Evangelism in CSF is more than just the usual “play-pray-proclaim” type of witnessing. It is not a one-shot deal. Evangelism in CSF is programmed. It will be done in a series of sessions and in different settings and occasions. This is to prevent from soft-selling the Gospel that will result to easy believism. It’s Gospel presentation emphasizes on repentance and the Lordship of Jesus Christ. And it does not sidestep the cost of discipleship. A depth-quality discipleship will usher spiritual deepening among young believers until “Christ is formed in you” (Galatians 4:19). The Growth Group program will be used to attain discipleship among young believers. Coupled with the aim of Christian growth and maturity, the young believers are also schooled on their local church’s privileges and responsibilities.